We’d love your help. 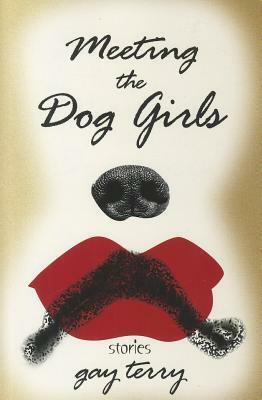 Let us know what’s wrong with this preview of Meeting the Dog Girls by Gay Partington Terry. To ask other readers questions about Meeting the Dog Girls, please sign up. I received this through a goodreads giveaway. This is a collection of short stories, most around 4 to 6 pages in length. In general the stories have quasi-scifi traits, but they're all pretty odd and don't really fall into any specific genre. The stories tended to be ambiguous and would lead me to think that there would be some sort of twist ending or interesting realization at the end, but instead most of them just came to an abrupt stop and I couldn't understand the point of what I'd read. I thi I received this through a goodreads giveaway. The words and images on the cover of this little treasure do not do justice to what is within. Terry's imagination and creativity are a welcome addition to my library. Again, I find myself reading short stories -- a collection of things. I used to think that I wasn't really into short stories, but really, I think it was just too many bad sets in a row. Suddenly emerge writers who bring new light to the "genre." Like Gaiman's Fragile Things, I found my Review based on ARC. Like Gaiman's Fragile Things, I found myself quickly turning pages of short little snippets that came to feel like personal friends. I both did not want each story to end and could not wait to get to the next one to see what else Terry had in store for me. Terry's gift is in presenting the crazy, the abnormal, the other-worldly with subtlety and elegance. 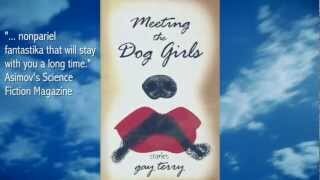 Gay Terry’s Meeting the Dog Girls is a mixed bag of bizarre short stories in the vein of Kelly Link. But that maybe too glib a comparison. For one thing, Terry doesn’t stick strictly to contemporary settings; many of the stories seem to take place in dark, imaginary worlds that are almost, but not quite, recognizable realms of ancient legend, fairy tales, fables and fantasy. The mood is different, too - fanciful, yet dark. Similar to Latin American magical realism, but not quite that either. The Gay Terry’s Meeting the Dog Girls is a mixed bag of bizarre short stories in the vein of Kelly Link. But that maybe too glib a comparison. For one thing, Terry doesn’t stick strictly to contemporary settings; many of the stories seem to take place in dark, imaginary worlds that are almost, but not quite, recognizable realms of ancient legend, fairy tales, fables and fantasy. The mood is different, too - fanciful, yet dark. Similar to Latin American magical realism, but not quite that either. The fact that Terry’s work is so hard to pigeonhole is one of its strengths. The best of these stories tend to be the shortest and most opaque, begging a second [and third] reading to unlock their mysteries. My personal favorite, “This Is Not a Pipe,” about a peculiar young woman and her bird companion living in a derelict old manse, was inspired by the surrealist paintings of Rene Magritte. In it Terry really manages to capture the oddness of his work with her imagery. At one point, the female protagonist is described as wearing a, “mousseline blouse and brocade pantaloons.” The entire story reads as if the author substituted the most obscure synonyms in the thesaurus as often as possible. But weirdly, it works. Other stories, like “The Line” and “The Prison of Kronos,” effectively depict dystopian visions of a subjugated underclass that are both chilling and resonant. And sprinkled throughout, there are satirical pieces with a contemporary setting, most enjoyably “The MacGuffin” in which a misanthropic New Yorker bonds with her neighbors when a Tom Otterness sculpture comes to life and takes up residence in her apartment, perhaps showing, in a literal sense, how populist public art can bring people together. Terry is less successful when her meanings are too obviously stated. Stories with an overt message, like “Episcatory” (pro-environmental) and “Unto Others…” (anti-prejudice) tend toward sermonizing, diminishing their value as literature and detracting from the power of the underlying message. But, fortunately, the proselytizing is kept to a minimum. I freely admit I did not finish this book. I stopped at the third time the writer improperly used the word loose instead of lose. The first time I thought perhaps it was a problem with the Kindle format, but at the third time of cringing over the fact that this occurred, I could only conclude that the writer and whatever excuse they used as an editor did not know the difference between a verb and an adjective. I recommend the writer buy a large dictionary and first have someone smack them upside I freely admit I did not finish this book. I stopped at the third time the writer improperly used the word loose instead of lose. The first time I thought perhaps it was a problem with the Kindle format, but at the third time of cringing over the fact that this occurred, I could only conclude that the writer and whatever excuse they used as an editor did not know the difference between a verb and an adjective. I recommend the writer buy a large dictionary and first have someone smack them upside the head with it and then afterwards perhaps they might use it before attempting to publish anything else. This collection consists of 30 pieces of short fiction that might be put in the bucket of speculative fiction. (“Speculative fiction” being defined as existing in a world unlike our own--i.e. sci-fi, horror, strange tales, and fantasy.) The stories are cross-genre, but “tales of the weird” is a common theme. Many of the pieces are too long for flash but on the short side of short story, though there are also a number that are of typical short story length. It’s a mixed bag not only in terms of ge This collection consists of 30 pieces of short fiction that might be put in the bucket of speculative fiction. (“Speculative fiction” being defined as existing in a world unlike our own--i.e. sci-fi, horror, strange tales, and fantasy.) The stories are cross-genre, but “tales of the weird” is a common theme. Many of the pieces are too long for flash but on the short side of short story, though there are also a number that are of typical short story length. It’s a mixed bag not only in terms of genre, but also in terms of the appeal. There were a few stories that I enjoyed, others that I didn’t care for, and—worst of all--a number that were utterly forgettable. Besides the strangeness, there’s another quality that might be called “quirky humor” that sparkles here and there throughout the collection. There’s a mini Tai Chi theme running across a couple pieces, so I dig that. If you enjoy tales of the strange and you can pick this book up at a good price, you just might like it. I loved some stories, but others I wasn't as impressed with. This is a book of interesting and thought provoking short stories. A must for anyone who likes the older style fiction. I received this book for free in a Goodreads giveaway.